The Richardson's Ground Squirrel is a medium-sized ground squirrel of rather uniform coloration. It is buffy yellow to grayish in color. The tail is about one-fourth of the total body length and is blackish to buff with whitish hairs on the outer edges and end. Adults are 7 to 9 inches long and weigh 11 to 18 ounces. Non-migratory. May exhibit emigration/dispersal movements. Occupies open well-drained land, prairies, and pastures. Can occur on arid shrub-steppe. Less well-adapted to arid shrub-steppe than is S. elegans. Primarily herbivorous. Eats leaves, flowers, and seeds of grasses and forbs. Domesticated cereals when available. Stores food in burrow. Will use insects and carrion. Allopatric distribution with S. columbianus from Canada border south to Madison and Beaverhead Counties. S. richardsonii and S. columbianus sympatric and even syntopic (along with S. armatus and S.elegans) in Beaverhead and Madison Counties. Possibly in Jefferson and Broadwater Counties. One litter annually, beginning as yearlings. Females typically mate 3 to 5 days after emergence. Most recent studies show gestation to be 22.5 days. Mean litter size at emergence from burrow is minimum 4.9, maximum 8.3. Carlsen, T. and R. Northrup. 1992. Canyon Ferry Wildlife Management Area Final Draft Management Plan. March 1992. Clark, T.W. 1970. Richardson's ground squirrel (Spermophilus richardsonii) in the Laramie basin, Wyoming. Great Basin Naturalist 30: 55-70. Confluence Consulting Inc. 2010. Montana Department of Transportation Wetland Mitigation Monitoring Reports (various sites). MDT Helena, MT. Confluence Consulting Inc. 2011. Montana Department of Transportation Wetland Mitigation Monitoring Reports (various sites). MDT Helena, MT. Confluence Consulting Inc. 2012. Montana Department of Transportation Wetland Mitigation Monitoring Reports (various sites). MDT Helena, MT. Elliott, Joe C. and Hydrometrics, Inc., Helena, MT., 1994, Supplement to wildlife baseline investigation life-of-mine expansion plan: Regal Mine, Barretts Minerals, Inc., Madison County, Montana. August 2000. In Life-of Mine Expansion Plan: Barretts Minerals, Inc., Regal Mine, Madison County, Montana. Vol. 2. App. C: Baseline Wildlife Reconnaissance. December 1999. Fagerstone, K.A. 1987. Comparison of Vocalizations between and within Spermophilus Elegans Elegans and S. Richardsonii. Journal of Mammalogy. 68(4): 853-857, 1987. Foresman, K.R. 2001. The wild mammals of Montana. American Society of Mammalogists, Special Publication Number 12. Lawrence, KS. 278 pp. Graham, Dean, and Craig Swick., 1977, A Field evaluation of the cyclone seeder for reducing Richardson ground squirrel populations causing damage in central Montana . August 1977. Hoffmann, R.S. and D.L. Pattie. 1968. A guide to Montana mammals: identification, habitat, distribution, and abundance. University of Montana, Missoula. 133 pp. Koeppl, J.W. and R.S. Hoffman. 1981. Comparative postnatal growth of four ground squirrel species. Journal of Mammalogy. 62(1): 41-57. Koeppl, J.W., R.S. Hoffmann and C.F. Nadler. 1978. Pattern analysis of acoustical behavior in four species of ground squirrels. Journal of Mammalogy. 59(4): 677-696. Land & Water Consulting, Inc., Missoula, MT., 2002, Montana Dept. of Transportation Wetland Mitigation Monitoring Report, Year 2001: Johnson - Valier, Valier, Montana. Proj. No. 130091.018. July 2002. In 2001 Wetland Mitigation Monitoring Reports, Vol. I. Land & Water Consulting, Inc., Missoula, MT., 2002, Montana Dept. of Transportation Wetland Mitigation Monitoring Report, Year 2001: Ringling - Galt, Ringling, Montana. Proj. No. 130091.015. July 2002. In 2001 Wetland Mitigation Monitoring Reports, Vol. II. Land & Water Consulting, Inc., Missoula, MT., 2002, Montana Dept. of Transportation Wetland Mitigation Monitoring Report, Year 2002: South Fork Smith River, Ringling, Montana. Proj. No. 130091.016. February 2003. In 2002 Wetland Mitigation Monitoring Reports, Vol. II. Michener, Gail R. and James W. Koeppl. 1985. Spermophilus richardsonii. American Society of Mammalogists, Lawrence, KS. Mammalian Species No. 243:1-8. Montana Dept. of Agriculture, Environmental Management Division, Helena, MT. 1885? 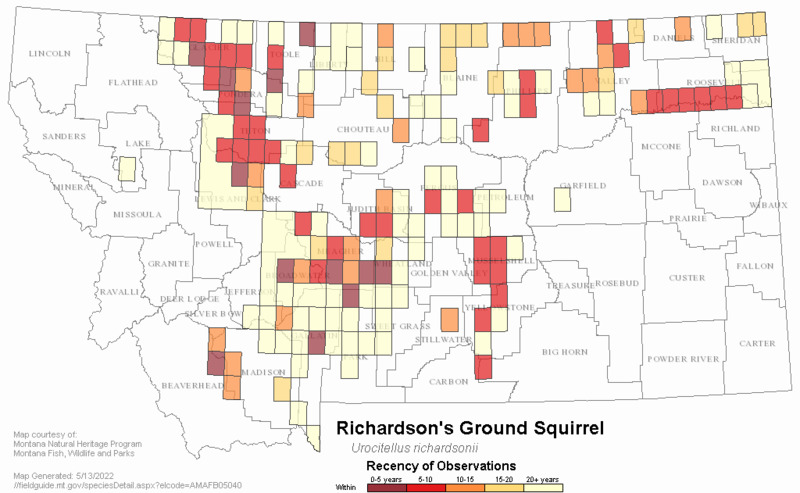 The Biology and control of the Richardson ground squirrel. Morrison-Maierle Env. Corp., Helena, MT., 1993, Biological assessment and wildlife reconnaissance, Holnam Cement Plant, Trident, Montana. In Application to Amend Operating Permit 00004 for Trident Quarries, Three Forks, Montana. Exhibit DD: Wildlife Reconnaisance Study. June 28, 1996. Reid, F. 2006. Peterson Field Guide to Mammals of North America, 4th Edition. Houghton Mifflin Company: Boston and New York, 608 pp. Sawyer, H. E. 1935. Studies on the rodents of Montana. M.A. thesis. University of Montana, Missoula. 111 pp. Schladweiler, Philip, and John P. Weigand., 1983, Relationships of endrin and other chlorinated hydrocarbon compounds to wildlife in Montana, 1981-1982. September 1983. Sullins, Monty, 1981, A Field comparison of 0.20, 0.35, and 0.50 percent strychnine grain baits for controlling Richardson ground squirrels. Tech. Rep. 81-3. July 1981. Sullivan, Daniel, and Monty Sullins., 1985, Acceptance of various rodenticide baits under field conditions by Columbian and Richardson Ground squirrels. Tech. Rep. 85-05. Sept. 1985. Swenson, J.E. 1981. 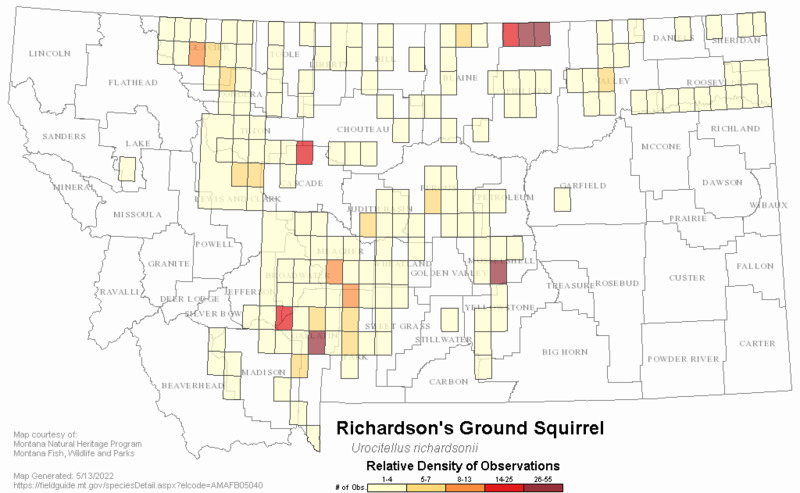 Distribution of Richardson's Ground Squirrel in eastern Montana. Prairie Naturalist. 13(1): 27-30. Urban, Larry, 2002, Biological Resources Report: Wagner Pit Wetland Restoration Site. Proj. No. STPX 56(50) CN 4645. February 23, 2002. In Wgner Pit WS#13 Upper Yellowstone, Yellowstone County. Fin. Dist. 5 AdminDist 5. Zackheim, K. 1973. Exhibit H: Wildlife Study. In Ash Grove Cement Co. files. 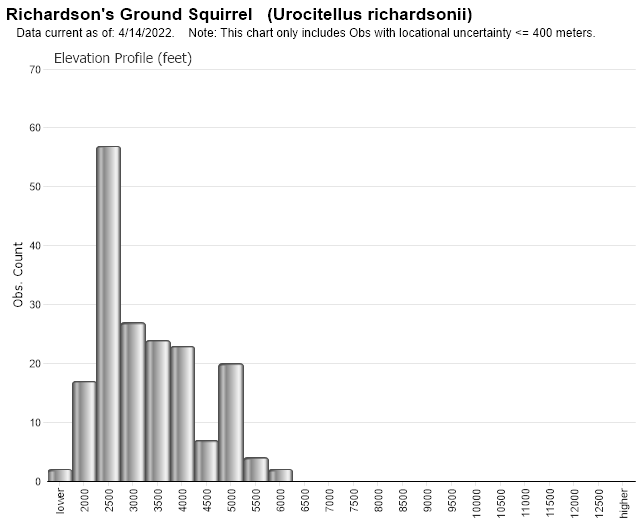 Web Search Engines for Articles on "Richardson's Ground Squirrel"
Additional Sources of Information Related to "Mammals"